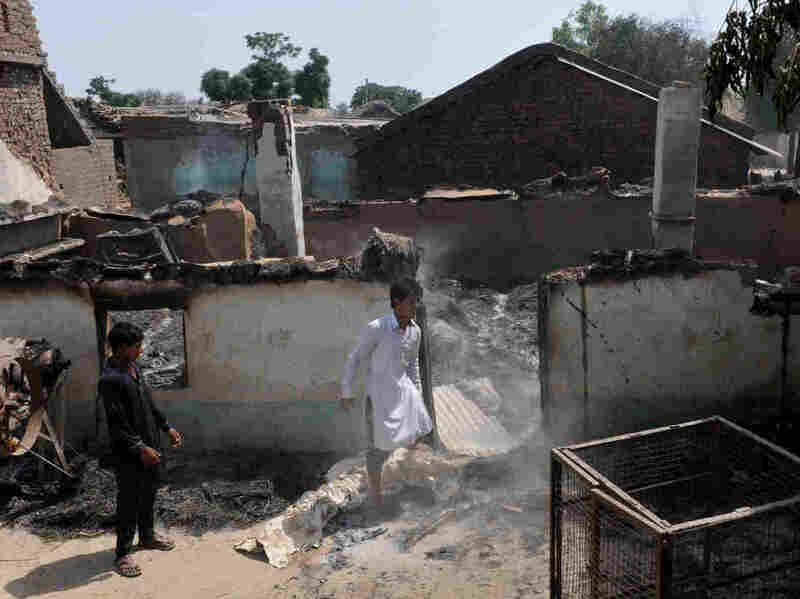 Villagers inspect the damage after their home was desecrated in the village of Jara Farm in Ranbir Singh Pura district last week off the Pakistani side of the border. After months of artillery fire across the heavily fortified de facto border separating Indian and Pakistani areas in the Himalayan region of Kashmir, New Delhi and Islamabad state that they have achieved a rare ceasefire. The Pakistani Daily Dawn reports that more than 100 Pakistani soldiers died in almost 18 months of cross-border artillery duels. The newspaper says the agreement to stop shooting "was reached during a hotline conversation between the directors-general of the military operations of the Pakistani and Indian armies" – Gen. Sahir Shamshad Mirza and Lieutenant-General Anil Chauhan. Dawn says that the conversation was initiated by the Pakistani side. The Times of India writes: "Development is coming after ceasefire violations (CFVs) in the first five months of 2018, breaking all annual records since 2003, with the two armies regularly deploying light artillery, anti-tank missiles, and heavy mortars attacking each other and civilians being caught in the middle. " India and Pakistan became separate territories after British rule The subcontinent ended in 1947. The fate of Kashmir, a lush and picturesque Himalayan valley, remained indefinite. Both sides claimed the region in its entirety. Kashmir was the subject of all but one of the four declared wars since the independence of the two countries, both of which now possess nuclear weapons.